As per the Fenton Street Market site: "Come see if you can top some of these gems from our 1st Joke Fest in 2010. After telling a joke on mic, children from ages 1-12 will receive an age-appropriate book (of their choice) authored by the How-To Cowboy (aka Edward Allan Faine). Young ones can make an animal sound in lieu of joke." (That last part was not made up). Saturday, July 28 and Sunday, July 29. Sally Kempton at the Willow Street Yoga Center Silver Spring studio. A weekend of meditation and modern yoga. Sunday, July 29. Piratz Tavern to host a "Bar Rescue" party. More details covered here in the Washington Post. Heard the episode is a hot mess guaranteed to get a few LOLs out of you. I hope this will help bring more patrons to the restaurant/bar (despite of their frozen french fries). I actually do love to hang out here and the last time I popped in for a drink the bar area was pretty busy. Hopefully the TV show will help them with getting the word out one way or another. Downtown Silver Spring and Arts and Humanities Council of Montgomery County have teamed up in search of a resident artist to "re-imagine the holidays" at the fountain plaza on Ellsworth. The application has been extended to Monday, July 30. So if you're still working on your monumental art piece, get 'er done! As per the Creative Moco site, this will be a temporary public artwork located on the fountain plaza. The theme for this project is sustainability through the use of recycled materials and/or sustainable energy. It will be available to view for about 10 weeks. Their project budget is $8,500, materials, and fabrication. Pretty good dough - and if you're an artist looking to get your name out, this might be a good start. Oh - also they will provide the fork lifts should you need them... More details on the Creative Moco website. Saturday, August 4, 2012. Walking Tour to Silver Spring's Original "Silver" Spring. Join Silver Spring Historical Society president Jerry A. McCoy on a walking tour to the spring after which our community was named and other historic sites surrounding the B & O RR Station. 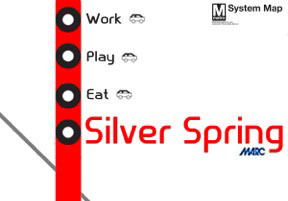 McCoy is the author of Historic Silver Spring (2005) and Downtown Silver Spring (2010), both by Arcadia Publishing. Cost $5.00. RESERVATIONS ARE REQUIRED. Email sshistory@yahoo.com or call (301) 537-1253. (Update) As per Discovery's tweet from earlier today (7/28), Chompie is starting to go up at Discovery. He'll remain perched up through the Discovery building for Shark Week, which starts Sunday, August 12 for their 25th Anniversary. Watch their underwater Shark Week announcement on Discovery's blog. Check out Jackie's new Carolyn's Espresso Semifreddo Sandwich, pictured on their Facebook page. It's a spin on the classic ice cream sandwich and it looks amazing. Don't forget the half price wines Monday nights at 8407 Kitchen Bar on Ramsey. I enjoyed an awesome meal there with a decent bottle of red from a winery in Santa Barbara, Zinfandel-Carignane-Sangiovese, which ended up being a steal at under $20. Tickets are free but you have to register. 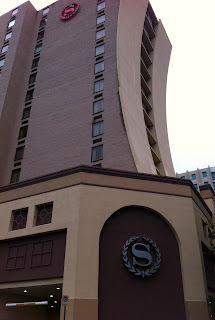 The transformation from Crowne Plaza into a Sheraton is complete. I peeped into their bar area on the ground flood and it looks like it would make for a good pre-going out meeting spot because of all the space. Might also be good for a large group to catch a game on one of their TVs. Know of any upcoming events I may have missed? Please shoot me an email here. Medication and modern yoga ? Nice combo ! SIlver Spring: Then and Again - Your event has been added. Thanks!